This weekend we are off on our yearly trip to Center Parcs Sherwood Forest, where we have been every year for the past 6 years. Where each trip has been slightly different. We’ve been without a baby, with a new born baby, with a 1 year old who couldn’t walk, and now we are going with a toddler. So for each trip we’ve had to consider different activities, and here are my top tips for entertaining a toddler at Center Parcs Sherwood Forest this Christmas. Toddlers love getting out and about in the fresh air (well ours does), and what better way to see the park is to hire bikes, or take your own bikes. We have hired two bikes plus a toddler seat for £29.00 each, and £14.00 for the toddler seat. That might seem a lot, but it is well worth it for the 3 days that we have them for. Plus it’s a really good way to get around the park, which is big, and saves having to walk all the way down to the Country Club. 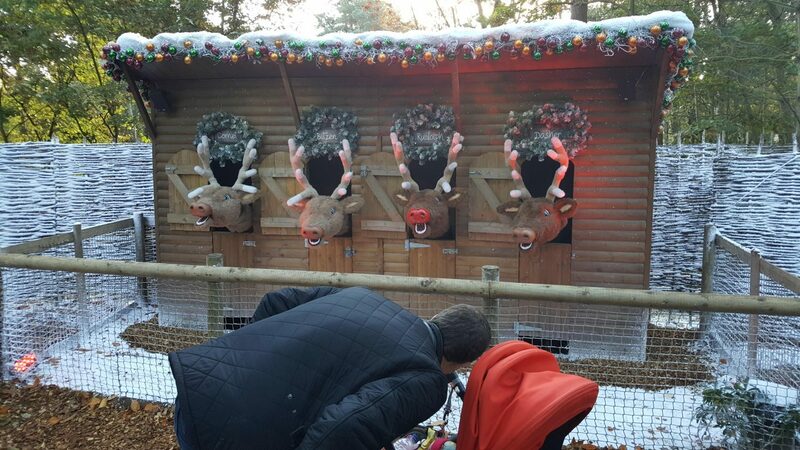 The Winter Wonderland at Center Parcs is amazing. The experience begins the moment you arrive. There are fancy lights in the snow covered trees, and a magical Winter Wonderland set-up with elves, mushrooms, presents and a huge Christmas tree. Now that our daughter is older she is definitely getting into the swing of Christmas, and already knows that there will be presents. So book a trip to see Santa with your little one. Every Sunday night on the lake there are fireworks, and this will be the first time that we will be going to see them (know that we know our daughter likes fireworks). We saw them pre-baby, but hadn’t taken her as a newborn or a 1 year old. This year we’ll be making our way to the beach on the Sunday night, all wrapped up in our winter woolies, to watch Santa appear on a boat on the lake, followed by a spectacular firework display. Get down to the Jardin Des Sports and watch your little one play toddler football for an hour with a bunch of other toddlers. It sounds crazy, but the instructors are a amazing, and play lots of games with the children, getting them to put lots of objects inside a hoop, collect objects, and shoot balls at the goal. It’s not just an hour of kicking a ball, it’s an hour of skill building and also getting used to playing sports with other children. This is one of the only free activities you can do at Center Parcs, and the pool at Sherwood Forest is amazing. It’s huge, there are loads of slides, a wave machine and a dedicated toddler area. We discovered earlier this year at Woburn that our daughter loves the pool. The toddler area is perfect for little ones, it’s shallow with water features, plus it’s open before the main pool on Saturdays and some days during the week, making it enjoyable for your toddler before the mayhem of the main pool opening. If your toddler likes a boogie and to run around like crazy, like ours does, then head down to the Elves Party Hour. We have never been before, but I am looking forward to getting in to the Christmas spirit with our little one, playing a few games, and doing a few crafts at the same time. So those are my top tips for anyone visiting Center Parcs Sherwood Forest this Christmas, and you have young children to keep entertained. Have you got a similar trip planned, and what’s on your agenda?